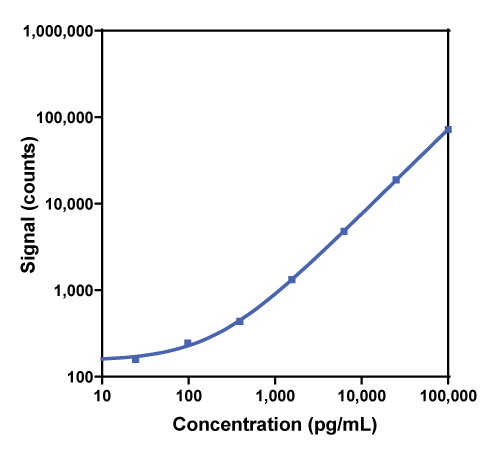 Calibration curve for the R-PLEX Human Corin/ATC2 Antibody Set was assessed and representative data is presented below. Description - Corin/ATC2 (CRN, Lrp4, PEE5, TMPRSS10) is a serine protease and a member of the trypsin superfamily. It is expressed as a transmembrane protein (type II) on cardiomyocytes where it processes pro-atrial natriuretic peptide (PANP) into its active form (ANP) through he cleavage of the N-terminus. The Corin/ATC2 protein can affect blood flow and blood pressure through this activation. Mutations in the human Corin/ATC2 gene have been reported to be associated with hypertension.